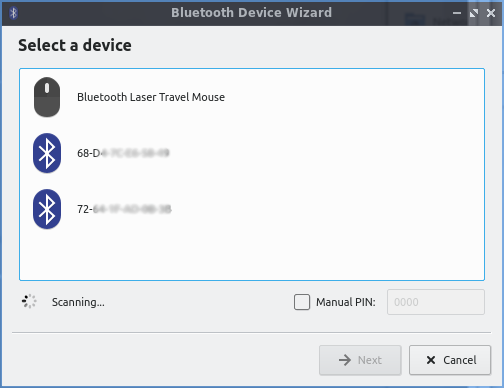 Bluedevil is the default application to manage bluetooth devices for lubuntu. Lubuntu ships with version 5.14.4 of bluedevil. To launch bluedevil to pair with a device from the menu Internet ‣ Bluedevil Wizard. If bluetooth is disabled you will be asked to enable it. In the main part of the window will show detected bluetooth devices. Click on the device you wish to add and press next. To send a file to another device after pairing with the device Internet ‣ Bluedevil Send file to open the file sending dialog. Then select the device you want to send a file to. Press the button with the upward pointing arrow to to bring a dialog of which files to transfer.